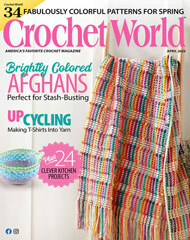 Confetti afghan - Accent your home with this cheerful, quick-to-stitch afghan. Afghan is worked with 2-ply mohair-look yarn using a size K/10 1/2 crochet hook. Size: Approx 45" x 59", without fringe.